I started this pinwheel baby quilt way back in December before the baby was born but couldn’t get back to it until school ended in May. Meanwhile, the baby was born and is now four months old! The quilt was finished and the package sent last week. They loved it! My inspiration was a similar quilt I found on Pinterest. I drew up my own version on Electric Quilt and started scrounging through my stash to see what I could find. I wanted it to look like it was for a girl without being too girly, if you know what I mean. I found some floral prints, plaids and checks that went well together. The background fabric I had to purchase. I can’t remember what it was but it might be Robert Kaufman’s Chambray. I just can’t be sure. I don’t look at the bolt ends all that much. Sorry. Slowly but surely I am working my way through my heaping piles of projects. The summer is going by WAY too fast! And I feel like I need to learn how to use my camera all over again. It has been sorely neglected. It’s darling! Great assortment of colors on that pretty background…soft but cheery too. Do you by chance still have some of that cute blue flowered print? I picked up a FQ recently and would love more but I need the manufacturer. Sweet! But not too girly. I love your fabric choices. 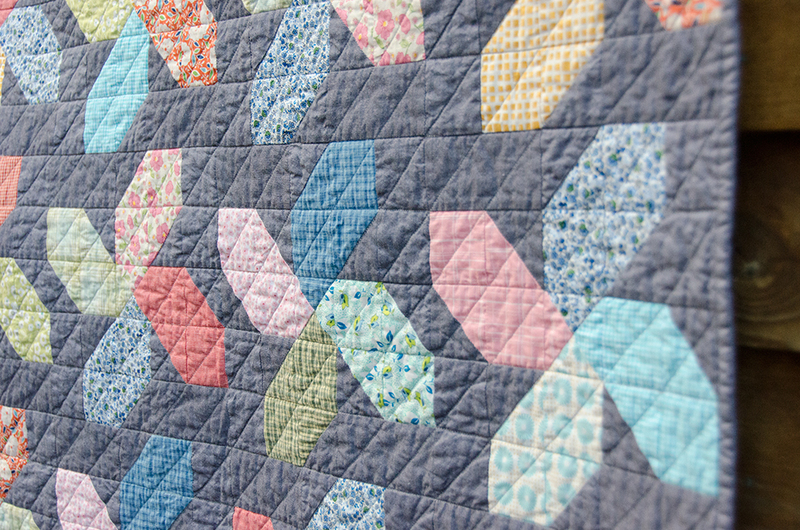 I really like the chambray for the background fabric – it makes the quilt so usable. I think white backgrounds scare people from actually using quilts. 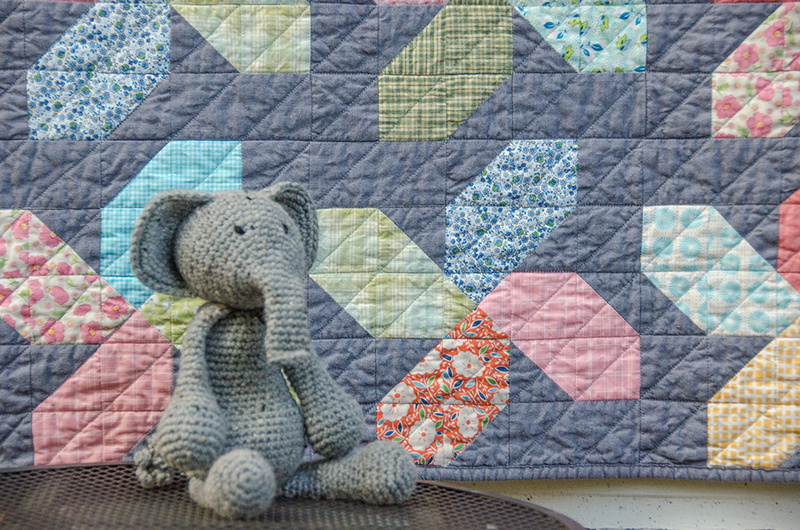 Very cute quilt and totally worth the (short) wait! I love your quilt! I really like the elephant also. Is there a pattern available for the elephant? Love this quilt! So clever and pretty! cool take on the pinwheel. happened upon your blog and have been enjoying the content. I appreciate the nice tutorials you have shared! « Any measurable progress is good, right? 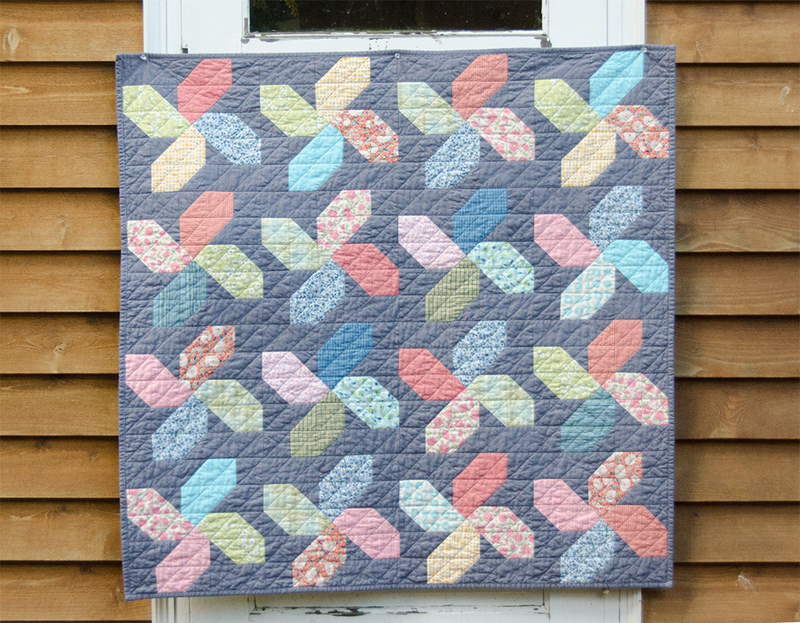 You are currently reading Pinwheels please at Bloomin' Workshop.